Hello peeps! What's been cracking in your neck of the woods? We continue to be blessed with some amazing projects, which explains my sad blogging track record these days. But that also means we always have some great reveals to share and this one is kinda fab, on a budget at that. We started this mammoth Hollywood project reveal last month and shared all the deets on the living room and entryway. 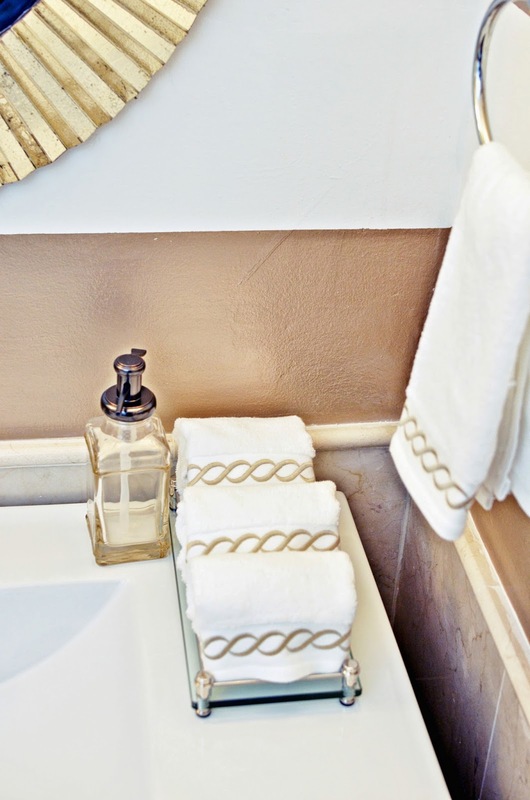 Across the hallway from the living room, is a powder room that was in dire need of some love and affection. Functional? Yes. But very bland and in no way reflective of the fun personality of its new owners. Now at first, we had lofty plans to demolish the entire room, relocate those pesky vent covers, layer with a fabulous wallpaper, new vanity and etc..But truthfully the budget had taken a beating in the rest of the home, and the thought of more demolition dust and chaos was a tad too much for our client Karen to handle. So we decided to keep the existing tiles, which were in great condition but finish the edges with some bullnose tiles. A new vanity was a must since that pedestal sink couldn't hold or hide much. A new mirror, lighting were also in order. 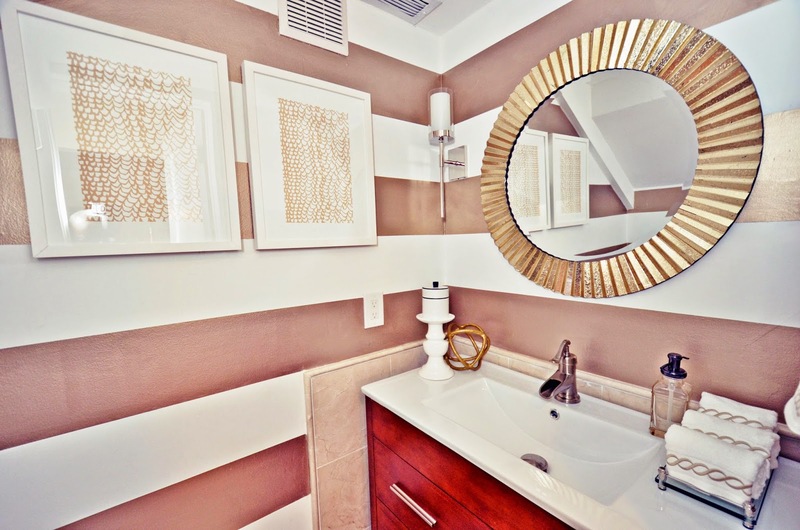 Since wallpaper was off the table, I needed a bold statement on the walls and decided to run stripes all the way around, juxtaposing white against a gold metallic paint. The talented Shaggy tackled this one of course and we gave you some peeks here and even had followers vote here for the vanity. I initially fell in love with these vintage inspired lights, but they were a tad bulky for the walls - Psst. Translation: Karen and Carl just didn't like em! So we switched to these instead. 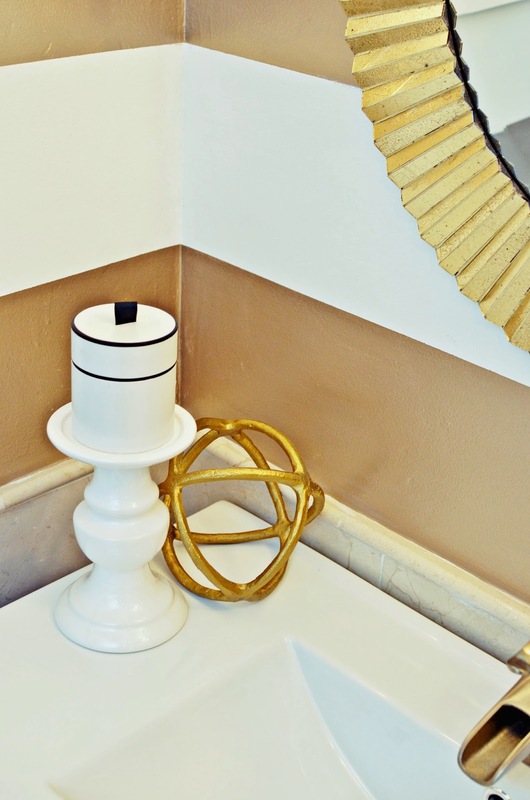 Love the old world charm of this Home Depot faucet and the weathered finish on this gold metallic mirror from Home Goods which was a steal. We finished it all off with simple accessories from Target and West Elm. 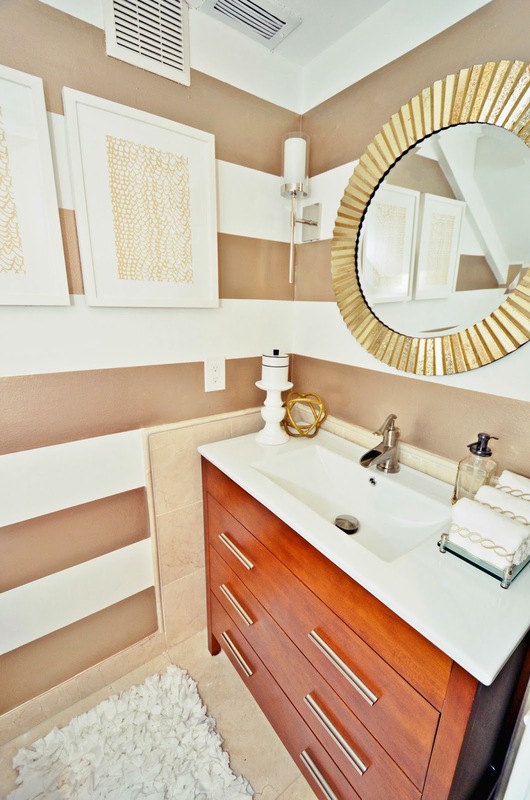 And voila, a new powder room was created without the added craziness of that pesky demolition dust. Let me know your thoughts. 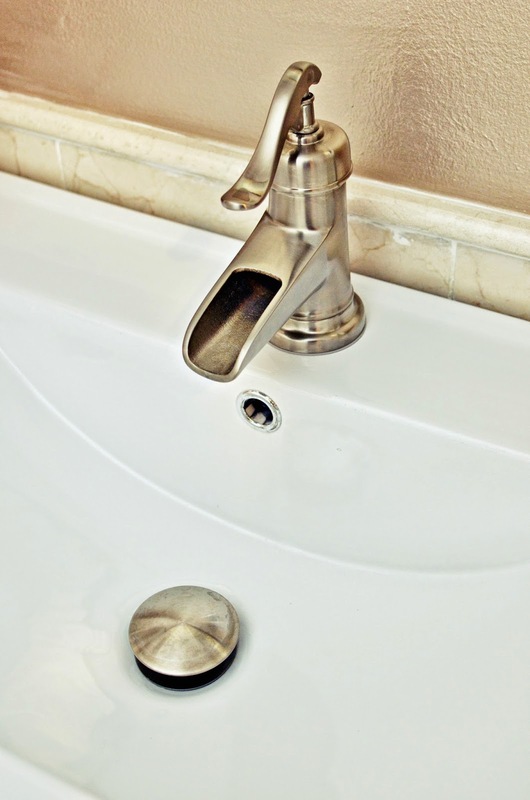 How have you saved some coins on a bathroom design? Looks absolutely divine!!!! Great job ladies! Fantastic! 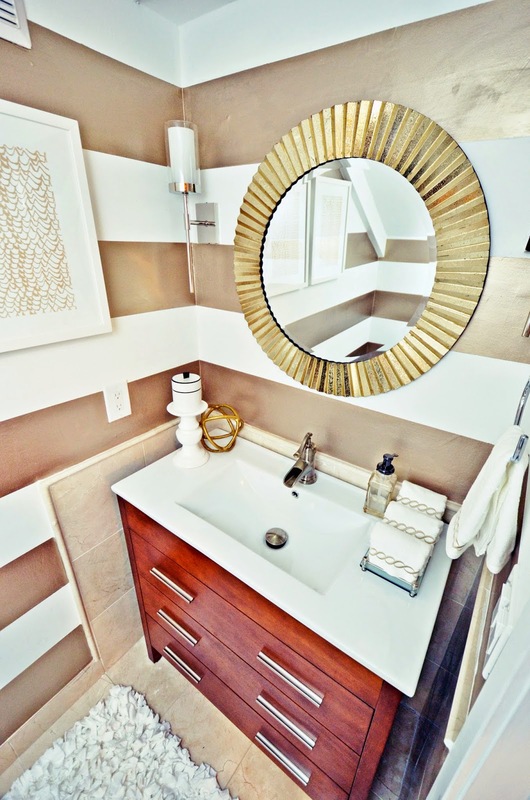 Love those gold stripes! Great solutions with high impact! Beautiful Job! 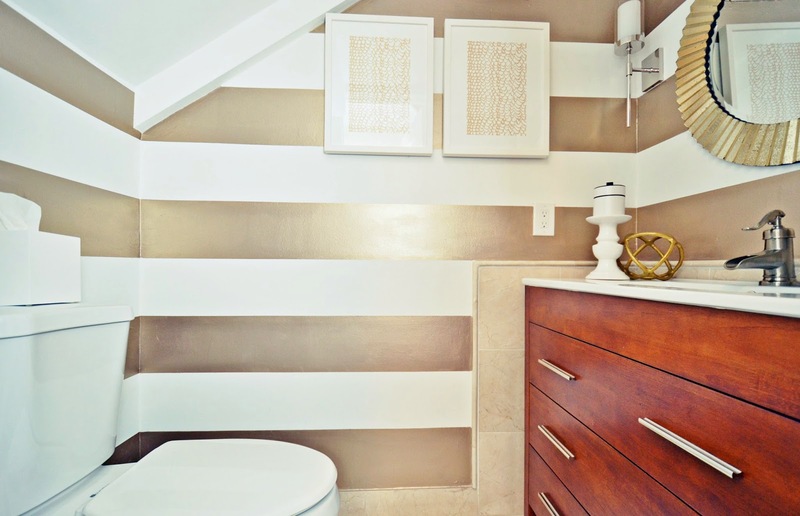 I love the gold stripes. Funny...in the before picture I thought - why did they do the tiles around the sink like that? In the after picture, I didn't even notice the tiles were still there until I actually looked for them. *claps and cheers* Great job! The stripes fixed a multitude of sins I see! I'm in the same boat as you are and hardly get to post anymore or even read other blogs but I'm glad i stopped by to see this great little reveal! Take care!